Kevin moves to Tucson to take a job with the University of Arizona working on the very exciting James Webb Space Telescope. This is a telescope that will be in space, see. Lara moves to Tucson to live with her parents, donate plasma for money, and get back on her proverbial "feet". They both download and start using the app "Tinder." 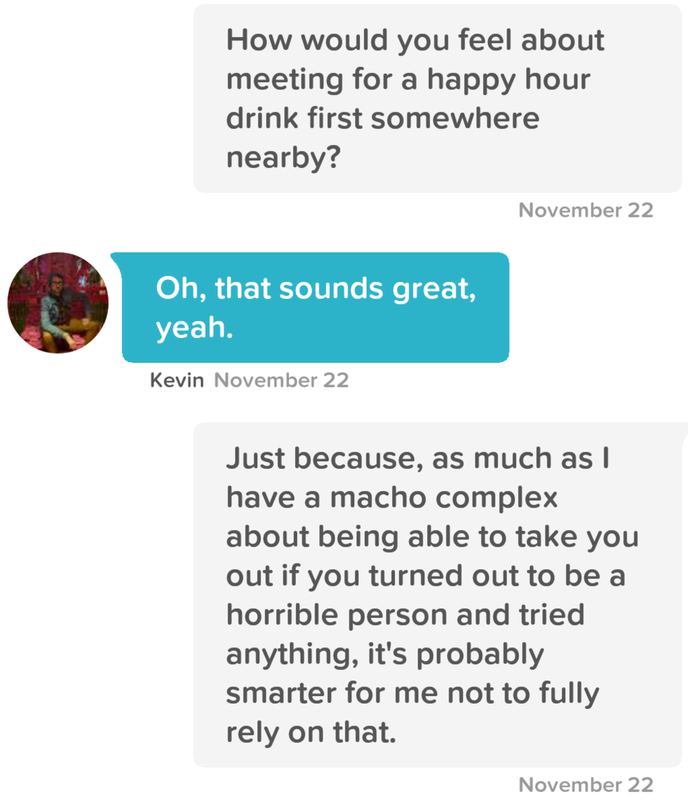 Tinder is a popular method to "feel bad about yourself" as you "judge other people" based on two to three pictures and approximately one or two sentences. In the future, Kevin and Lara will "feel embarrassed to tell people that this is how they met" but "whatever, it worked." Kevin and Lara "match." Lara has requested that her match be someone who is a nerd about something, likes to read, and that the message contain an existential question. Kevin CHECKS ALL THREE OF THESE BOXES WITH APLOMB. They will send approximately 900 messages over the next week, as Kevin has to travel back home to Southern California for Thanksgiving, precluding their being able to meet up and go on a date. After one week of messages, they finally are both in the same town. They decide to go on a date. They decide to cook Ethiopian food at Kevin's house. Seriously, this is what they decide to do on their first date. (This is a bar in Tucson. They have a pretty ideal first date. Dinner is very good. They have an exciting rhythm in the kitchen as they cook together. They talk for a long time. They drive out into the desert together. It is a very clear night, and the sky is full of stars. They kiss under these stars. IT IS AS ROMANTIC AS YOU MIGHT EXPECT. They do, of course, go on many more dates. Kevin and Lara sing karaoke. Kevin gets completely schooled by Lara on the bowling alley. Kevin learns that Lara can roller-skate backwards. Lara learns that Kevin is a pretty competent ballroom dancer. Kevin and Lara cook five million more dinners. They read books aloud to each other. Mostly they just see if there are any limits to their own enthusiasm. Lara asks Kevin if he trusts her. He does. They get in a car and drive. First they arrive at the lounge where they sang karaoke on their third date to find that it is all set up for a private karaoke hour. A few friends join in and Kevin and Lara sing a VERY ENTHUSIASTIC duet of "Kiss From a Rose" by Seal. Do not laugh, it is a very good song. A private swing dance lesson set to Whitney Houston's "I Wanna Dance With Somebody". They finish the lesson sweaty and tired, BUT KEEP GOING. It's time to go roller skating! At the rink, Kevin and Lara head over to the skate rentals and are asked for their shoe size...by Kevin's friend Anna who has flown in from New York! They start to skate, and the music changes. The music has shifted to include songs that they both love, DJ'ed by...wait, who is that? Oh hey, it's Kevin's college friend Michael, who has also flown in! At this point Kevin is pretty overwhelmed. Lucky for Lara he is too overwhelmed to notice what this might all be building up to. In spite of his (many) complaints, she blindfolds him and drives to Sidecar, the bar where they met. She gets down on one knee and asks him to marry her. He says, of course, yes, yes. And then they walk into the bar, where they are greeted by his parents and even more out of town friends. Their Tucson friends and family start showing up, too, and then their friend Michael from LA walks in all nonchalant and starts DJ'ing the most important dance party they've ever attended.